Invoice Professional enables small businesses to quickly create tax invoices, quotes and statements on the go. 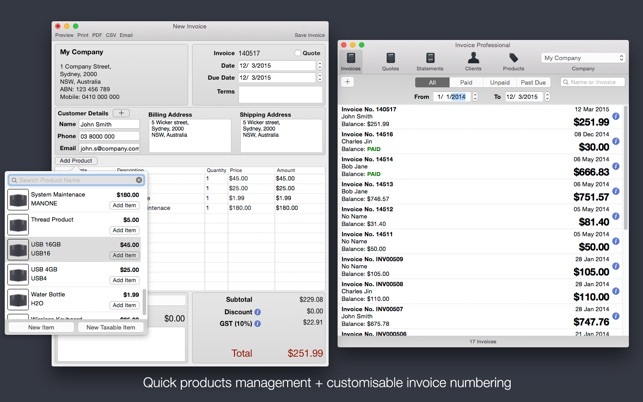 - Customisable invoice number format. 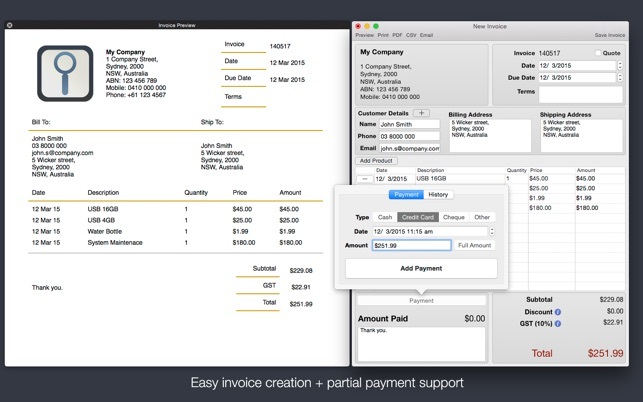 - Customisable invoice field naming. - Keep a list of your products. - Print out invoices and statements. 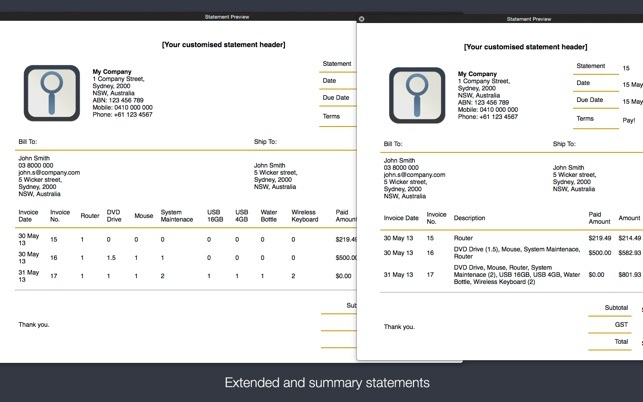 - Export invoices, quotes and statements out as PDF. - Email invoices, quotes and statements as PDF via Email. - More currency and numeral display options. Good Program but needs some tweaking ! I invoice companies not just individuals, but it only has a spot for “Name” so I have to choose between the Company name, I am sending the invoice to or the contact person, or billing dept. Also, on my invoices it sometimes calls for me to show a credit on the invoice, not the same as a payment, but a credit for a particular item or discount, unable to do credits with this program. It could also use a little help in the payments area. It allows to select the payment type such as “ cheque” (where I come from it’s called a “check”) but anyway doesn’t allow you to elaborate on the payments such as the check #, or type of CC used. Please keep working on this guys & gals! It’s a good simple program! Let’s make it a great one !!!!!!! PLEASE :-) !!!!!!!! 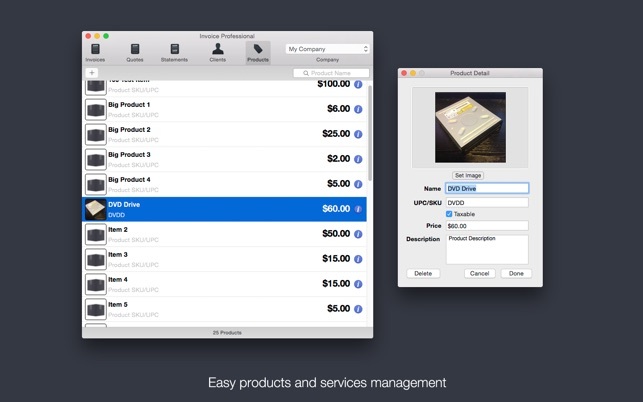 FINALLY A USER FRIENDLY INVOICE APP!!! I AM REALLY HAPPY WITH THIS APP. I have bought and subsequently “dumped” at least six previous invoicing apps ~ Most were way to complicated for me. With this app, I WAS UP AND RUNNING WITH INVOICES THAT INCLUDED MY LOGO IN JUST A FEW MINUTES! If I can do this, anyone should be able to do so. I would rate this App as a “10” (or FIVE STARS) IF I could have statements for all customers printed with one “click" (presently, you have to print out statements one-by-one). ALSO, a simple report or list of all receivables with a total would be soooo helpful. A future upgrade, perhaps? I would happily pay for these two extra “tools”. All-in-all, however, for the price ~ I am very happy with this app. I should give 5 star if this app has estimate. But overall for the price is good..